Dennis Rodman and Karl Malone are among the new players unlocked in the new update. As is generally the case, the patch will come through automatically as long as you have an active Internet connection. If you encounter any difficulties, try restarting or checking for the update manually. 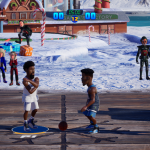 Feel free to leave any impressions or thoughts about NBA 2K Playgrounds 2 in the comments section below. If you’d like to take the discussion to the NLSC Forum, we have a topic for the game here in our Other Basketball Games board.